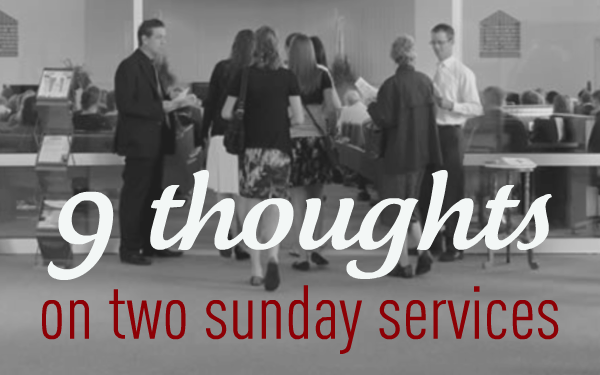 Why does the consistory call the congregation to worship twice? 1. There is no direct command in the Bible to do this. But keep in mind that there is also no direct command for women to take part in the Lord’s Supper. Sometimes we derive practices in the Church from biblical teaching and its implications. Some things in our worship are taken from the Scriptures by good and necessary consequence. 2. In the Old Testament, there were morning and evening sacrifices, see Numbers 28:4, Ezra 3:3 and other passages. 3. At the beginning of the New Testament era,the first Christians came together on the Lord’s Day in both the morning and the evening, continuing the practice they had as Jews. Hence, the New Testament church did not change what had always been done by God’s people. They maintained the principle of worshipping twice, though the coming of Christ meant a shift to worshipping twice on the Lord’s Day. 4. There is not only a biblical/theological argument, there are also good practical reasons. One would be that having two services helps to maintain the character of the Lord’s Day as a day of worship. 5. Another good practical reason would be that the Spirit works with the Word to transform lives. So, it would be prudent to have more, rather than less, opportunities for God’s people to sit under the preaching. 6. When there are two services, there is a greater opportunity for the pastors to provide a balanced diet of preaching and teaching for the congregation. The congregation benefits from getting more teaching and on a broader range of texts or topics (as in Catechism preaching). 7. There is a quality of spiritual life that develops and thrives around the worship of God twice on the Lord’s Day. Something about being in church with God’s people twice every Sunday has a wonderfully positive effect, producing not only Christian individuals but a whole Christian culture, a community lifestyle distinguished by its caring, Christ-like quality, and a missionary zeal that reaches out to the whole world. 8. Finally, the consistory calls the congregation to worship twice expecting that we will want to worship twice. Why would any believer not want to worship God and come under the means of grace (Word and Sacrament) as often as possible? 9. The last few reasons do not compel us to have two services as such (in other words, we could use those reasons to argue for three or four services). Nevertheless, the principle of “more rather than less” does justify having two services versus having only one.